Why risk your property insurance? Get it done professionally! Book your gas appliance installation, repair or replacement online or over the phone. A gas safe registered technician will arrive promptly and execute the required service in compliance with all relevant safety codes. A thorough safety check and function test will be performed upon completion of the gas cooker/hob installation, repair or replacement. You will be provided with a gas safety certificate to confirm that you can confidently use your appliance. Enjoy the extra peace of mind that a Fantastic gas safe plumber is on the case! When a certified gas cooker installer handles your gas appliance servicing or equipment replacement, you can put your mind at rest that all safety procedures are strictly followed. Why choose our gas cooker fitting or repair solutions? Connecting or disconnecting gas cookers and hobs during a replacement, installation or repairs process carry hazards to properties and people. Therefore, homeowners are legally bound to hire a gas safe registered specialist for all types of gas work maintenance and installation tasks. We, at Fantastic Handyman London, work with licensed gas safe engineers and certified electricians who can install, repair or replace your built-in or freestanding cooking appliance, whether it is fuelled by gas or electricity. The technicians carry their photo IDs and licence number at all times, hence you can rest assured that your gas cooker installation or hob replacement service is Gas Safety Regulations compliant. Important: Doing a gas appliance repair yourself or letting an unqualified person to perform the gas cooker fitting for you may not only invalidate your property insurance, but it is also a serious offence. Furthermore, it may result in a poor installation that could be outright dangerous and put human lives at risk. What to expect from our gas appliance service? The engineer will first ensure that all gas connections are safe to use. If you have an old cooker that needs to be removed, the technician will safely disconnect it. Your new appliance will be connected and the gas supply tested for tightness to make sure that there are no leaks. The cooker/hobs will be then tested to confirm that they function correctly and to the manufacturer’s specifications. The Fantastic gas safe registered specialist will perform a final safety check before providing you with a gas appliance installation certificate and completing a competence form for warranty purposes. The specificity of the service calls for a preliminary inspection on site (a minimum of one hour applies). The licensed gas safe engineer will investigate the issue and determine whether it is related to combustion, gas flow, gas leak, gas supply, etc. You will be provided with a precise quote for the repairs, which, if possible, will be completed on the same day. If the repairs cannot be done on the day of the inspection, your service will be scheduled for another day that is convenient for you. *Your gas plumbing repair service is covered by a 6-month guarantee. Why do I need to hire a gas safe registered engineer for a gas hob installation or repair? At the end of every gas installation, replacement or repair job, the expert is obliged to provide you with a gas safe installation/repair certificate. The procedure is required by British Law. What are the implications if I try to disconnect or connect a gas appliance myself? You can put your family, tenants and property in danger if you are not legally qualified to service gas appliances. Carbon monoxide poisoning is a potential hazard that can result from improperly connected gas-fuelled equipment. What gas appliance services do you offer? Fantastic Handyman can install, replace or repair gas ovens, hoods, gas boilers, gas cookers and hobs, as well as dual-fuel ones. 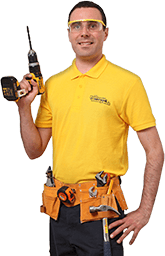 We work with both gas safe registered engineers and certified electricians to execute our appliance installation and repair services. How long does a gas cooker/hob installation or replacement usually take? In most cases, your gas appliance fitting service will be completed in about an hour to an hour and a half. We cover the area of London, within the M25 zone.